for $185,000 with 2 bedrooms and 2 full baths. This 1,232 square foot home was built in 1998 on a lot size of 2.4900 Acre(s). 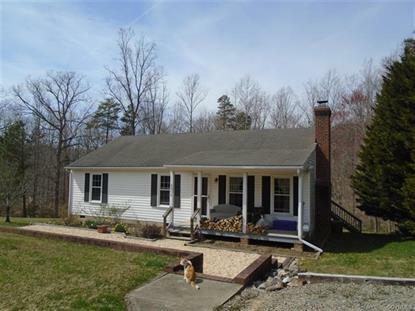 Extremely cute 3 bedroom 2 bath rancher on 2.5 acres located in the picturesque Hadensville area of Goochland approx 1.5 miles from the interstate, the Goochland Drive-In Theater and The Royal Virginian Golf Course. The house is located on a private gravel road with only 2 other houses. PRIVACY, PRIVACY, PRIVACY. Enjoy quiet evenings on the front porch or out on the back deck overlooking your partially wooded back yard and the wildlife that surrounds you. Beautiful wood floors are found in the living room along with a true brick fireplace that currently houses a small wood stove. In the kitchen you will find oak cabinetry with a space for a dishwasher, while down the hall there are three spacious bedrooms as well as a hall bath and master bathroom. The water heater was replaced approx 5 years ago along with the windows and the HVAC was replaced approx 10 years ago. Appliances do convey with the property.